Last week Politics was in control of the markets as it will be this week, but the ride will get a whole lot bumpier. Also, last week, gold and silver moved up mostly because the markets have not factored in the possibility of Trump winning the U.S. Presidency. Market traders have thought about Trump as President, it is their worst nightmare, that is why they have tried to ignore it by putting it in the back of their minds; plus they've always thought that Clinton has had it in the bag. That was until the FBI announced that they are reopening the Clinton email case. Now as Trump's poll numbers rise, the U.S. Dollar and the markets fall, while gold and silver rise. This movement in the markets will continue at least until Election day on Nov. 8th and if Trump wins the Presidency, expect it to continue. The markets are Real Nervous about Trump. If Trump wins the Presidency of the United States, expect a whole lot of volatility in all the Markets, from Tuesday through to who knows when the hysteria will stop. The initial shock will last at least a week, and volatility will continue in the markets, but it is impossible to say how long it will last because the Markets find Trump that hard to judge. 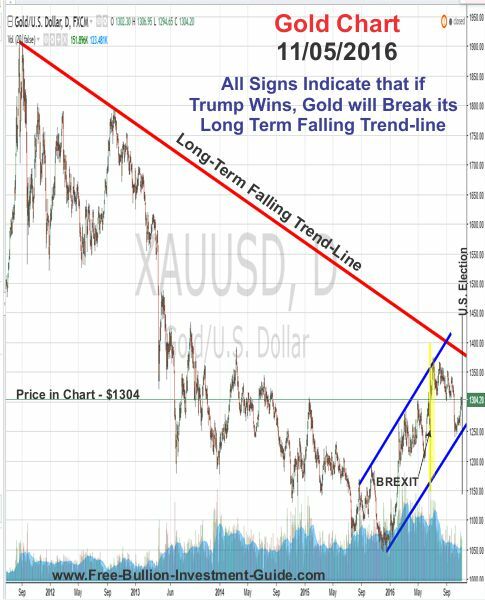 For Gold and the other precious metals, I expect to see a spike in prices, bigger than BREXIT. In the Gold Chart below, I've indicated BREXIT which happened on June 23rd. In conclusion, I've stated in the past that in the markets on a daily basis Gold and Silver trade relatively the same, but in the long-run, silver leads to gold. 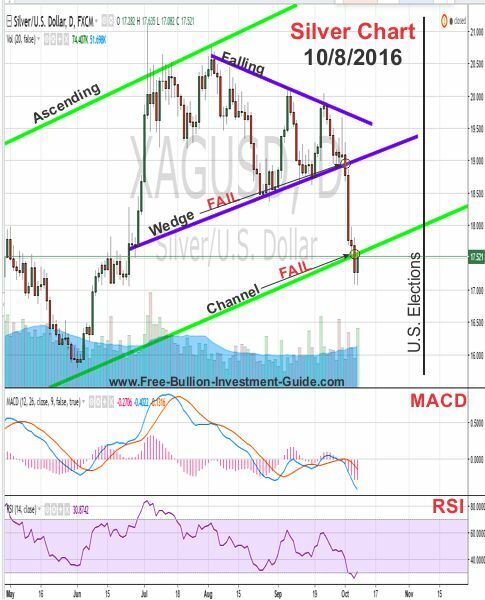 In the charts that I have posted in the past, below, I've noted that Silver has already broken all of its 'Long Term Falling Trend-lines,' so it could be a foregone conclusion that Gold will follow Silver's Lead and break its oldest and last Falling Trend-Line too. A closer look - (click charts to see blog post). 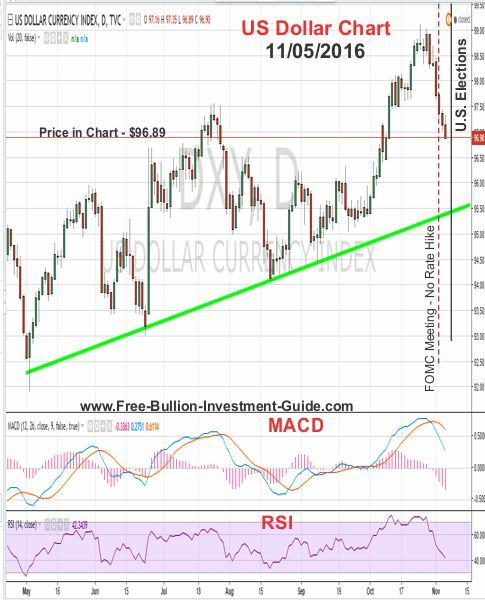 However, this commentary isn't all rosy for the precious metals; Silver has also recently broken some negative territory that could mortally hurt Gold's bull market, if Clinton Wins. 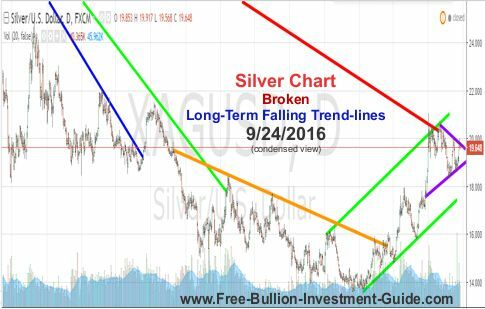 If Clinton wins, expect Gold and Silver to Drop and the U.S. Dollar and broader markets to climb in price. 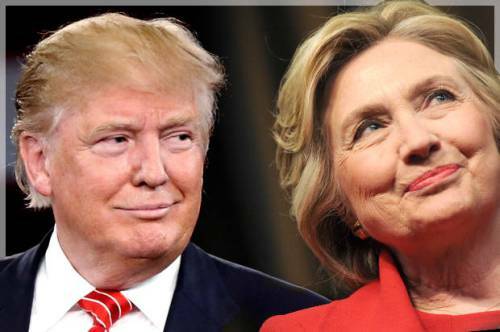 The market views Mrs. Clinton as 'More of the Same' or as a 'Safe Bet, ' and it is expected that if she were to win the presidency nothing much would change. 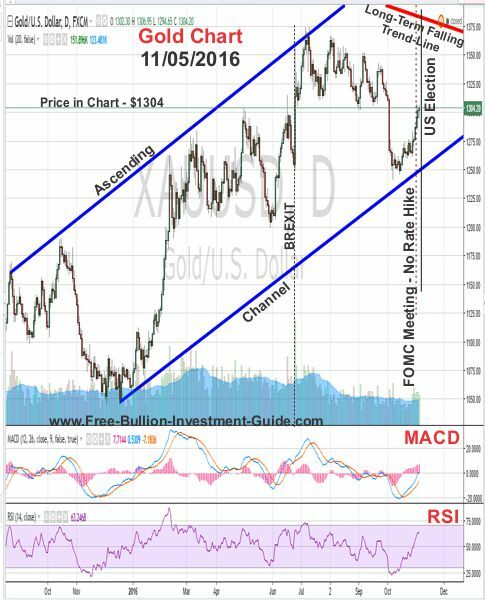 The chart below was posted on this blog on 10/08 after silver fell in price and broke its ascending channel; which could be a future indicator of what will happen to Gold if Clinton Wins. Last week, gold and silver moved up because of the slow trickle of news about the Clinton emails and Trump's rise in the polls. The maroon dotted line indicates the latest FOMC meeting on Nov. 2nd, which practically had no effect on the markets because of the election. In all the charts this week, there isn't much anyone can interpret through 'technical analysis' because the results of the U.S. Election will determine which way the markets will move. The red-line at the top right of the chart is the 'Long-Term Falling Trend-line' I mentioned in the introduction of this post. 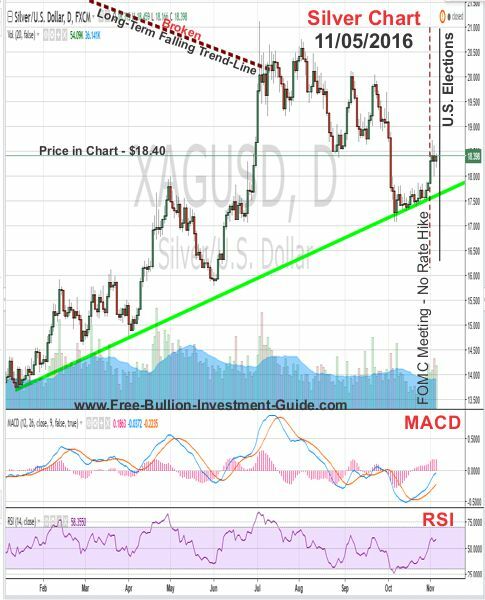 As you can see after last week's move in gold, it doesn't have far to go to reach it. 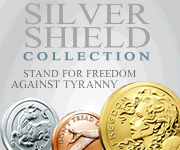 Like gold, silver rose in price for most of the last week, but as I stated above it is a waste of time to try to do technical analysis with the markets are nervously waiting on the election results. Silver's 'Cup and Handle' has moved a little further in the formation of the pattern but we'll have to see the election results before any confirmation in a pattern can be made. 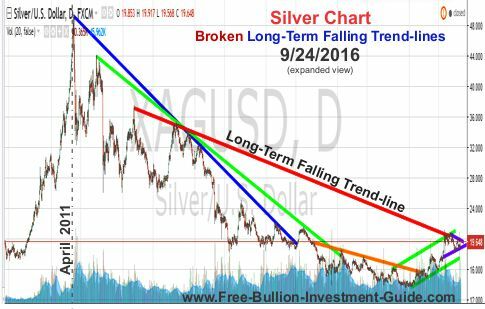 The maroon-dotted line at the top left of the chart is Silver's 'Broken Long-Term Falling Trend-line' that I mentioned in the introduction. The U.S. Dollar fell all of the last weeks, with Trump's rise in the polls weighing it down. Also, the Fed's announcement on Nov. 2nd to keep rates at their low levels didn't give the U.S. Dollar any strength which added fuel to its falling price. This week I listened to Garth Brooks - here is the one song that every time I hear it, it sticks in my head; The River. To let those who may not visit this blog know that when I can I prefer to listen to music when I work and for the last five months I’ve been sharing with the reader’s of these posts the song or songs that are my favorites.